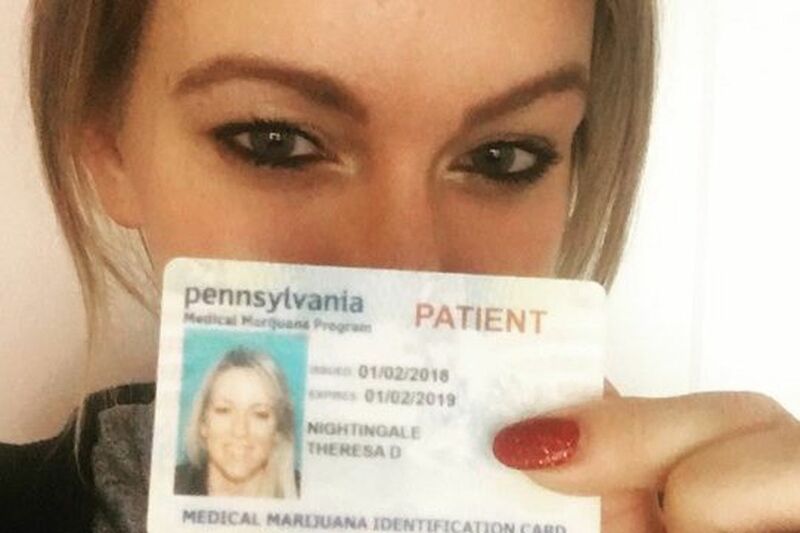 Theresa Nightingale, a medical marijuana activist in Pittsburgh, received her registration card two days before Christmas, 2017. Federal law prohibits such card holders from owning a gun. The town drunk can buy firearms. So can someone who has been involuntarily placed in a mental hospital for a short stay. But anyone who wants to treat Crohn's disease with medical marijuana is forbidden from owning a gun. But some sick people will have to make a difficult decision: Is taking the medicine worth surrendering what gun-owning advocates see as an enshrined constitutional right? "It's hypocritical," said lawyer Andrew Sacks, the co-chair of the Pennsylvania Bar Association's Medical Marijuana and Hemp Law Committee. "You can be an opioid addict, or buy a bottle of rum, drink it and go to a store and buy one," Sacks said. "But a person who is registered as a medical marijuana patient in Pennsylvania, and has a very small dosage of THC, can't own a gun to protect themselves or hunt." A state police spokesman strongly suggested that patients also consider the consequences of holding on to any guns bought before enrolling in the medical marijuana program. "It's unlawful to keep possession of firearms obtained prior to registering," spokesman Ryan Tarkowski said. "The Pennsylvania State Police is not in the business of offering legal advice, but it might be a good idea to contact an attorney about how best to dispose of their firearms." Twenty-nine states, including Delaware, New Jersey and Pennsylvania, have legalized marijuana in some form. But under federal law, all forms of marijuana remain strictly forbidden. The DEA considers it a Schedule 1 drug, on par with heroin and LSD, with "no currently accepted medical use and a high potential for abuse." "There are no exceptions in federal law for marijuana purportedly used for medicinal purposes, even if such use is sanctioned by state law," said Duvall-Jones. The U.S. Court of Appeals for the Ninth Circuit ruled last year that the federal prohibition does not violate the Second Amendment. Gun dealers last year were sent an ATF bulletin that left no room for loopholes. A dealer who even suspects that a customer may be using cannabis is obliged to stop a sale, ATF's Duvall-Jones said. Federal regulations bar firearms ownership to anyone who illegally uses a controlled substance or might be addicted to any drug. Alcohol is not considered a controlled substance, Duvall-Jones said. "Therefore, a person who is addicted to distilled spirits, wine or malt beverages would not be prohibited" under the law. A federal judge in Pittsburgh ruled last week that the government could not restrict the gun ownership rights of a man who had been involuntarily placed in a psychiatric hospital. "If you're a card holder, you'll be flagged," said Tarkowski, the state police spokesman. "It's game over if you check 'yes,' " said Jim Benoit, owner of Cajun Arms in West Chester. "I can thank you for coming by, but I'll have to tell you I can't sell you this gun." Patients also may be required to surrender guns and ammo bought before joining the marijuana program, whether they are using the medicine or not. Police in Honolulu, Hawaii, fired off letters this month to patients ordering them to turn in their weapons. The following outcry had the department put the order on hold two days later. No other jurisdiction has made a similar request. "The compromise most of those states are reaching is 'no new guns for patients,' but they're not tracking down guns and asking them to be surrendered," Dansky said. Commenters on one Second Amendment online group had mixed feelings about the law. "How far of a jump is it to extend this process to other medications?" said Cephas, a longtime member of the Pennsylvania Firearms Owners Discussion Forum. "Antidepressants and warning of suicidal thoughts come to mind. Someone has a rough spot in their life, gets help, and the next thing they know they're prohibited." "I'm against government promotion of the narcotization of its citizenry. A doped-up, dumbed-down electorate is certainly no bulwark against tyranny," he said. "As for stoners and firearms, I vote no, but they probably present less a public threat than the alcohol-fueled maniacs who wreak havoc among us already." And that's part of the problem. According to Dansky, law enforcement agencies are operating under the belief that medical marijuana patients are just looking to get high. But for stoners, it's less of a hassle, and probably cheaper, to find a dealer of illegal pot on Reddit or Instagram. "You have to go through a significant amount of work to get a medical marijuana card," Dansky said. Those hoops include state charges, doctor fees that aren't covered by insurance, and a criminal background check. Buying illicitly "is a lot easier."